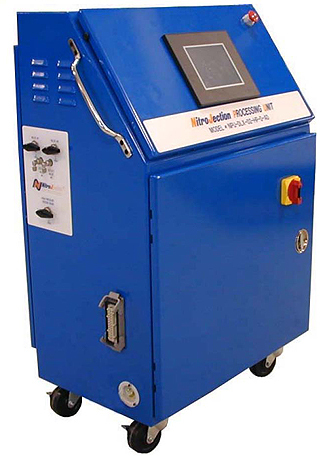 The NitroJection Processing Unit (NPU) is a stand-alone, portable, gas assist controller which intensifies and injects high pressure nitrogen into molds through either NitroJection’s patented gas-assist nozzles or In-Mold Pins. The NPU is available with one, two or four outlets. The NPU features seven stages of digitally controlled nitrogen injection pressures per outlet. The 8″ color E-Z touch screen allows for operator input of timing, pressure profiles, and recipe storage. An Automation Direct Programmable Logic Controller ( PLC ) monitors and controls the unit. New features include auto purge, remote outputs and independent start signals to allow gas injection to multiple presses. The NPU includes an internal booster and a high pressure receiver. The system will intensify up to 10,000 psi maximum system pressure. Booster Max: 10,000 psi System Pressure – adjustable by operator set via touch screen – only from NitroJection!